Finally! We're getting a much needed break from the spring clouds and cold rain! I got my first red-cheeked sunburn this weekend. Here's an overview of this phenomenon from our weather Guru, Cliff Mass. And this is also a reminder that with the annual major shift, from winter to spring regional weather patterns, we'll see more clouds soon enough. We still have June-u-ary to get through! A nice May sea-run cutthroat. I got out on the beaches with some good friends this week, on the first best day we have had in a while. The water and wind were perfect, with the temperature improving all day. We fished the ebb all day, and caught a little of the flood too. By late afternoon the water was greasy slick and just sliding in from the sea. Perfect trout water. We caught quite a few smaller sea run cutthroat trout, some were obviously out in the salt for the first time, at 6 to 8 inches. we caught a few over 12 inches too. We had fish feeding in front of us for most of the day, which is always the happy circumstance. The high morning tide was not too deep or strong, with a soft ebb, so that allowed the forage to stay around longer, and the hungry trout too. On major tide ebbs the current can sweep the smaller stuff away for miles. Right now there are so many different forage species and juvenile salmon around, that the birds and fish are having no trouble feeding here all day. And it helps too when the water conditions are rapidly improving, after a string of rough, windy, gale-force days last week. If we had fished the afternoon before, it would have been like dragging your fly through a mile long salad all day. It took just under 12 hours of almost no wind for the weeds to clear away in many locations. You want to be here when this happens. A gale force wind will churn up the silt, and weeds, turning the waters a chalky grey, and this will put the fish and bait down. Way down. This can reduce the feeding opportunities for the trout. But give it one night of light winds and waves, and the shallow water feeding game is back on. With this nice forecast for the week or more ahead, it's definitely time to get out there and cast a fly for these wild sea-run coastal cutthroat trout. 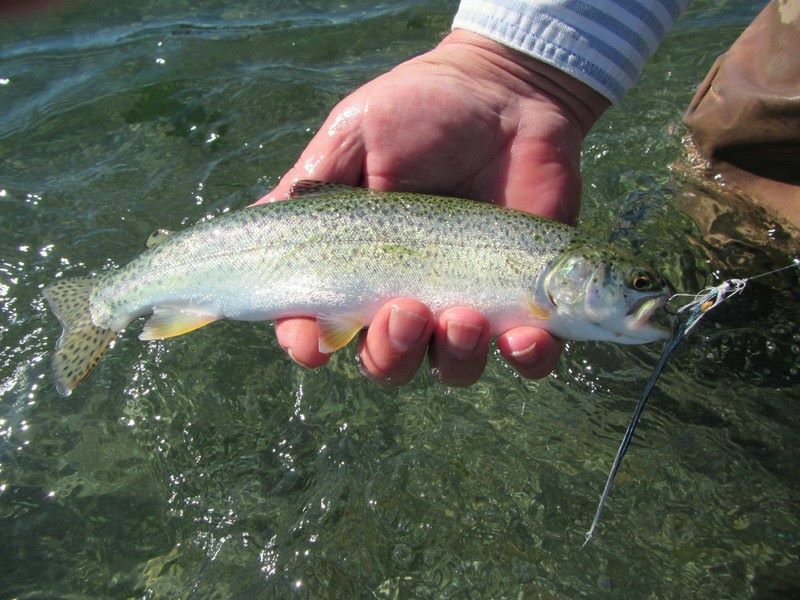 A pretty gem of a spring sea-run cutthroat trout. Caught on a six-inch-long flat-wing sandlance fly. I am guiding fly fishers on the Olympic Peninsula beaches, rivers and streams. We walk and wade, fly fishing for sea-run Coastal Cutthroat trout in freshwater and saltwater, and in the rivers for trout and summer steelhead. This is strictly catch and release, traditional fly fishing only. Lunch, snacks, soft beverages, and use of some equipment is included. I also offer personalized, private and group fly fishing and fly casting instruction, for beginners through expert casters. I would be happy to help you plan your Olympic Peninsula fly fishing adventure. 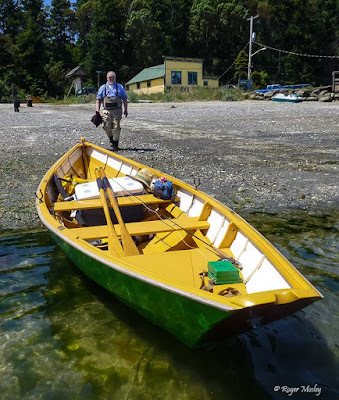 I also do public presentations for civic groups, private gatherings, and fly fishing clubs, Naturalist guide, rowboat picnics, tide pool and river trail day trips. Please call, write, or email for booking details. Now booking for spring through fall 2017! And sometimes we row . . . One angler only. This is the way to go fly fishing for sea-run Cutthroat! SSShhh!!! Listen to the quiet . . .